My mom used to make poori with wheat flour.Longtime back I tasted this Maida poori in my friend's place and needless,to say I became the fan of it.In general I dont make pooris often at home.Last weekend,I made this Maida poori after a very long time..say few months:-) For side dish,my first choice is always Channa Masal.The poori tastes good with Channa Masal. 1. Mix flour with salt and yogurt. Add water and make smooth dough. 2. Cover and keep aside for an hour or more. 3. 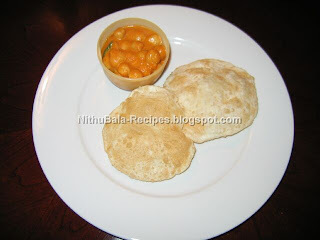 Make Pooris and serve with Channa Masala. yummy combo!!... looks absolutely tempting!!! Hi nithu a stylish blog award is waiting 4 u in my blog pls come and garb it.